The predominant acid in wine is tartaric, but this is not the case in the developing grape. In the grape prior to veraison, the dominant acid is malic acid. Malic acid, through gluconeogenesis, is actually converted into glucose for metabolism within the berry. Citric acid is present at lower levels as are several other acids. At veraison, the levels of malic acid begin to quickly fall and the berry becomes less tart and astringent. Determination of harvest date can be based upon laboratory analysis of acid, tannin, and polyphenol levels or upon “chewing a grape,” the process of human organoleptic analysis. The goal is to have sufficient acid to balance the fruit and the tannin. During alcoholic fermentation, acidity is preserved; unless malolactic fermentation follows, then acidity declines. (Malolactic happens with virtually all red wine.) The perceived level of acidity in a wine is critical to its structure—if too low, a wine is perceived as “flabby” or not crisp and refreshing; too high and a wine is labeled as overly sour. To the taster, acidity is identified as “tartness” and is measured by the degree of saliva required to neutralize it. Tartaric acid is a strong acid, and is unique to grapes. Prior to veraison, it may reach levels of 15 grams per kilogram. In must, it is 3 to 6 grams per liter. Malic acid reaches levels in excess of 20 grams per kilogram in unripe grapes. In warm climate musts, its level is 1-2 grams per liter and in cool climate musts, its level is 2-6 grams per liter. This point leads to what acidity really represents. Acidity is defined by the concentration of hydrogen ions (aka protons) in a solution. This can be expressed as pH, total acidity, or as titratable acidity. These are not the same. For the math geek, pH is a negative logarithmic value. A wine with a pH of 3 is ten times more acidic than a wine with a pH of 4 (Three to four is the general range of pH in wines). In other words, a jump from a pH of 3 to 4 means that the wine with a pH of 3 has ten times as many hydrogen ions (protons) than the higher pH wine. Sadly, not all acids are created as equal and some are stronger than others. Yes, some have more protons and are stronger. This leads into the concepts of total acidity and titratable acidity. Total acidity is a measure of all acid in the wine, regardless of its strength. And titratable acidity represents the amount of a basic (alkali) solution required to neutralize acidity to a reference end point (typically a pH of 8.2). Although there is some correlation of the numbers for these three measures it is not absolute; total acidity is probably the measure which most closely correlates with the sensory perception of acidity in a wine. 6. has the potential to heighten the astringency of tannic wines, particularly if the tannins are under-ripe or over extracted. Thus, the chemical backbone relative to acids has a strong impact upon the sensory properties of the wine. We have both taste and tactile receptors for acid. This is a complex statement and is appropriate for a complex set of compounds called “polyphenols,” a term which references the chemical structure of the building blocks. These polyphenols can undergo chemical bonding with proteins, other polyphenols, and acids. They are important flavor, color, and structural compounds. This entire category of chemicals undergoes, over time, the process of polymerization with other polyphenols, anthocyanins (pigments), and polysaccharhides (sugars), i.e. smaller molecules bond together to create larger ones. This process is mediated by acid and oxygen. Once these polymers reach a certain size, they precipitate from solution forming sediment. In wine, tannins are derived from two general sources: grapes including stems and pips, or wood—generally meaning oak. Tannin also can be added to a must as powder. Bitterness and astringency are associated with tannins. The mouth sensations occur because tannins bond with the proteins in saliva, decreasing lubrication in the mouth. The degree of this, and its pleasant or unpleasant effect, is based upon the quantity and quality of the tannins. Generally, tannins provide a mouth sensation which is “drying.” (This may range from bitter to astringent—a point addressed later). In parts, this can be ascribed to the level (volume) of tannin compounds present, their degree of polymerization, and the level of ripeness of the grape from which they are derived (back to the concept of go “chew” a grape to assess ripeness). Brown, woody stems with brown woody pips are indicative of ripe polyphenolics. Generally, long chain tannins are thought to be perceived as more astringent while short chain tannins are perceived as bitter. The longer chain polyphenolics precipitate out of solution, thus leaving the less astringent shorter-chain tannins. But, ripeness and vinification manipulations (or lack thereof) are only part of the story. Acid levels impact our sensory perceptions of both the nature (quality) and level of tannin. No manipulation can force an unripe polyphenol to be perceived of as ripe (although some might try to mask the greenness with oak or a blending grape). A scientific discussion of tannins has not been included, because how they function is poorly understood. We do know that controlled oxygenation impacts the nature of tannins through chemical reactions. We also know that different sources (grape, oak, stems etc.) contribute different tannins. We also know that the evolution over time- polymerization and bottle age- represents an ongoing process of chemical reactions that impacts the nature and quality of tannin in a textural way. These textures are impacted by the degree of fruit ripeness, fruit handling, and vinification. The sensations range from granular to ripe and rich to vegetal/unripe/coarse. Recall the following points: acidity mitigates astringency of ripe tannins; this is a textural sensation. white wines need higher acidity to texturally compensate for substantially lower tannin levels as a structural component. Also, tannin levels are determined based upon the grape varietal(s) and wine style. Sugar and alcohol can offer sweetness to soften the astringency of tannin. Thus, balance is a prerequisite for pleasant perceptions as a whole. The volatile compounds producing the aromas of red and black fruits, spices, dried herbs (think dried oregano), roasted nuts and meat, and savory notes have not been discussed. These represent the general aromatic/taste profile of Sangiovese. Without a balance of tannin and acid, even the most appealing of aromatic profiles falls short. Strategies exist to achieve this ideal structural balance either with Sangiovese alone or in a blend where it dominates. Viticultural and vinification factors are critical to improving the quality of Sangiovese-based wines. 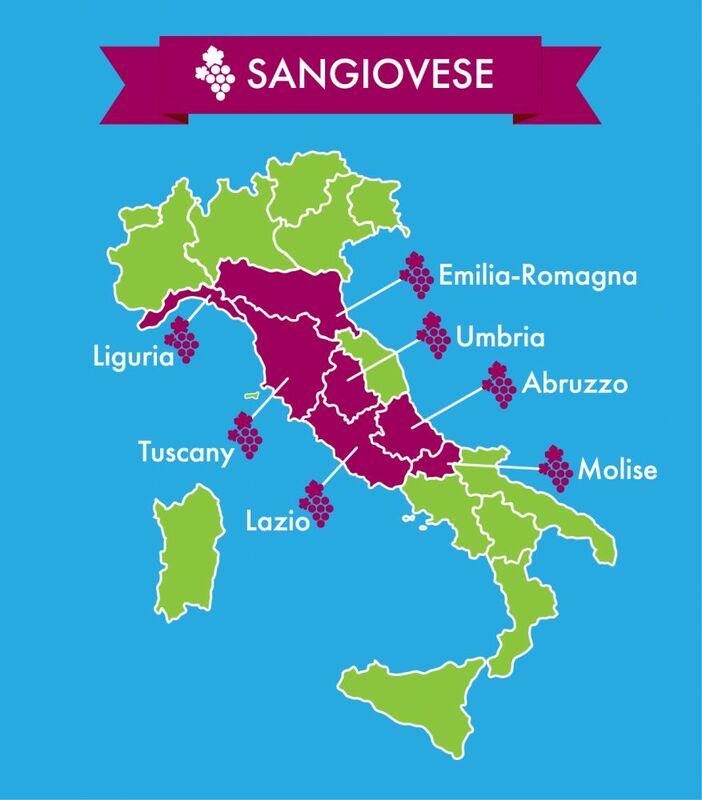 As it is a variety prone to mutation, there are multiple cultivars of Sangiovese. As a variety for which site is critical, it is clear that placing the optimal cultivar on a given site is key. Site selection is based upon altitude and exposure, maximizing the greatest potential for the cultivar chosen. Viticultural practices need to focus upon achieving optimal polyphenolic and sugar ripeness while preserving acidity levels. To do this, over-cropping is avoided at all costs. Vinification strategies are abundant. These range from regimens of new, neutral, or old oak versus neutral vessels, maceration time, extraction techniques, maturation, and blending. Most Sangiovese or Sangiovese-based wines begin with a pH of 3.3 to 3.4. After malolactic fermentation, they have a final pH of 3.6 to 3.7—well within the acceptable realm for a typical Old World red wine. Total acidity is the differentiating factor. The ultimate goal remains the same, to achieve a harmonious balance of the structural components of acid and tannin with a complex and intense aroma profile. These are achieved by selecting optimal sites and clones. Winemaking interventions relative to oak are those of “seasoning” as opposed to “dominating”; blending partners are to enhance the structural and aromatic characteristics of Sangiovese without overwhelming. This is harmonious balance defined. When achieved, the fruit, acid, and tannin strike a marvelous chord. A vinous journey through Tuscany is truly an experience of tradition versus transition. Historically, there is a very long time line of wine production and those traditions cannot be ignored. The transition is recognition of modern viticultural and vilification science, and its juxtaposition to tradition: it goes back to the future. One could bullet point the practices, but it really boils down to a simple but oft forgotten caveat…as stated by a young enologist, “We make all of our choices based upon taste.” The science may be modern, but the practice is entirely traditional. The point of this essay was to contemplate the interplay of only two factors—acid and tannin—as they impact organoleptic results. This ancient wine region and grape has had a well-documented history of market success over the last 50 years illustrating the benefits found in merging traditional and modern practices with the end goal of harmonious balance.